Everyone has a friend, or a friend of a friend, with a trailer horror story. Thanks, I don't need to hear about it. I certainly don't need a picture (My Lord, who took that picture on the right? ). My imagination is plenty good enough to envision all the different ways horses can get frightened, stuck, injured, flipped, and impaled while traveling. I know why so many horse's don't want to load -- because they're sensible! No, I don't want my horse hurtling through space at 60 miles and hour in an unpadded metal box. You gotta trailer. The first time Riley trailered with the divider, he was two years old. As we pulled away from the barn, I was close to hyperventilating -- would've given my eyeteeth to have a trailer cam. He was fine. Even so, I've hinted to my hauler that it would be a handy thing to have. He claims not to know much about trailer cams, so I offered to do some research. So I've compiled some info, and next time he trailers me I'll leave my little product review on the dashboard. Here's what I found out. Trailercams sound simple to set up, and who wouldn't want one? 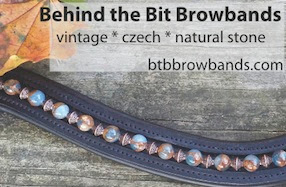 They are not that expensive; they allow you to monitor your horses (video and audio); some do double-duty with hitching up and backing up; and some can be set up in the barn when you're not travelling. Direct cabling is the most reliable setup; there is little or nothing to interfere with transmission. 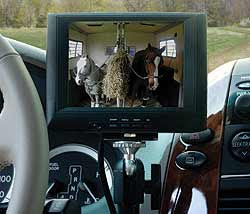 A video monitor is mounted in the cab of the truck, and a cable connects the monitor to the camera in the trailer. The system can be black and white or color w/infrared (to see in the dark). The video monitor is is powered either by lithium battery pack, by 220 volt adaptor, or more commonly by the cigarette adaptor (12 volt DC). A 20' cable runs from the monitor through a the "access hole" in the truck, along the frame to the hitch site, where it ends in a weatherproof connector. The camera is mounted in the trailer and usually it gets its power from the monitor cable. If not, it is wired into the lighting system for power. The camera has a 30' cable that runs to the hitch via an access panel or doorway. The cable from the camera attaches to the cable coming from the truck. When you itch the trailer, just connect the cables, and you're set to go. A hard-wired system will run about $500-600 depending on options (color, BW, infrared, monitor quality/size, durability, etc). The wireless solution eliminates the need for wires that run from the trailer to the truck. However, wireless systems are prone to outside interference. Instead of cables, a wireless transmitter and receiver are used to send the video and audio data. The monitor in the truck cab will have a built-in or standalone receiver, and like the hard-wired solution it will require a power source. The camera mounted in the trailer has a cable that connects to a 2.4 ghz transmitter that is affixed to the exterior of the trailer. 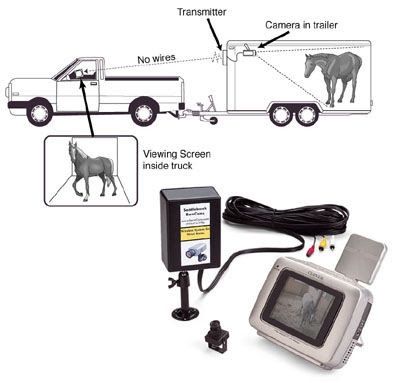 The camera and transmitter usually receive power by tying into the lighting system of the trailer. A wireless system will run $700-800. You can use your laptop rather than buying a monitor for additional capabilities and cost savings. The camera, cable, and video capture card will run about $350. I quoted pricing from "turnkey" vendors. If you buy the components and set them up yourself, you might get by more cheaply. The dealers provide purchase and setup support, warranties, and other services that are helpful to the trailercam newbie. Some of these systems are so easily dismantled and set up that you can use them in the for other purposes, such as in the barn. If you select a system to meet the needs of both environments (specifically the transmitter/receiver specs), your system can do double duty. Some of these systems can be configured as a backup mirror or to assist in hitching up. Some more good ideas to consider. Thanks. I would probably get in an accident watching the trailer cam too much! Costco had wireless backup cameras (like for RVs) for something like $60 (IIRC) recently. The image quality probably wasn't as good as what's shown in your post, but it might work. I don't know why a wireless camera would care if it were mounted on the back of a motorhome of the front of a trailer.